Several athletes arriving in Nigeria to take part in the Africa Senior Athletic Championship are stranded at Murtala Muhammad Airport in the main city of Lagos and at Asaba airport, 500km south of the capital, Abuja. The games officially start on Wednesday in Asaba, Delta state, but the news ahead of the event has been dominated by the travel mishap. 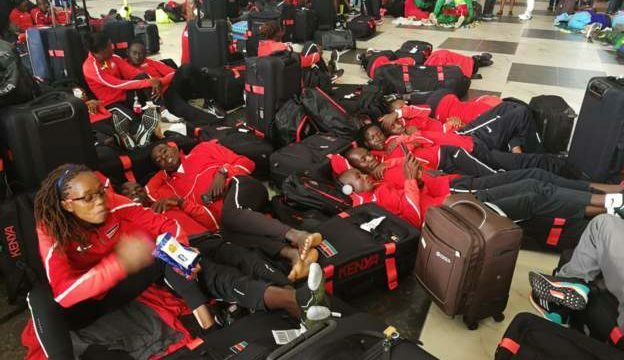 Participants from Burundi, Kenya, Eritrea and Burkina Faso, remain stranded at the airport in Lagos. Some lucky athletes, who managed to bypass the travel problems, have been training at the event’s venue. At least 52 teams confirmed participation at the event. Preparations for the event started in November 2017 but doubts had been raised about Asaba’s readiness. “When I came here I couldn’t believe Asaba could host this event”, Africa Athletics Council President Kalkaba Malboum told reporters. “When I visited this stadium last year, I didn’t believe this stadium would host the tournament this year. I am very happy and proud of what has been achieved”, he added. ‘’Some months ago, when we were told we were to host this competition, I was scared in my mind, but I can truly say the local organising has done a great job. We are essentially ready for the competition, looking forward to a healthy competition’’. Their buoyant assessment is however not shared by the athletes and foreign officials arriving in Nigeria. Algerian team coach, Benid Amar, whose team travelled to Lagos via Paris, says he witnessed teams being stranded at the airport for two days. “I have participated in a lot of Africa championships, but this championship has poor organisation,” he said. South Africa’s team manager John Matiani blamed the local organising committee for the ongoing problems. Nigeria’s Blessing Okagbare, the ex-commonwealth games double sprint star, however defended her nation saying that it was not easy hosting such an event. There has been no comment from the Nigerian officials but they are working to resolve the issue.